There is no disputing the fact that American’s love their hamburgers. Many love to grill their burgers year-round – hot or cold out. Whether you are grilling for two in your backyard by the pool for a romantic evening or planning a big old family and friends cookout– a classically grilled hamburger would always have its special place at the table. Now, most people think that the key to grilling a most succulent, tender, juicy and delicious burger lies in the selection of meat. In their defense, it is not entirely wrong, but also not the complete story. While the fat to meat ratio plays a huge role in how juicy your hamburger patty will turn out, the seasoning mix you use to flavor it can also play a vital role. The good old classic American hamburger is usually made with ground beef. The generic spices and herb mixture you already have in your pantry might not work very well for that, especially if your everyday food revolves around chicken. As opposed to chicken, seasoning a beef patty requires a blend of more complex flavors for the taste to really stand out. So, when you pick a seasoning mixture for your ground beef patties, make sure it is potent enough to infuse the required flavors. Another thing to consider is the method you would use to season your meat for grilling. Different seasoning methods require different spices. Not all spice blends work the same for all seasoning methods. When picking seasoning for hamburgers, you really have to keep your audience in mind. When it comes to grilling hamburgers, 80/20 beef ratio works like a charm every time; the 20 percent fat keeps the meat tender while being grilled and you get the juiciest burgers out there. But, not everyone prefers beef. Hamburgers are now made from lamb, turkey and even beans (vegan). So, pick a seasoning mix that you know would work well with everything. Strong spice mix may work well with the classic 80/20 ratio but can over-spice chicken or turkey. The whole point of seasoning your hamburger patty before grilling is to infuse the necessary flavors. Make sure you don’t go overboard with the seasoning, though. Balance is what you desire in a classic hamburger patty and there really is a thing called “too many spices”. Stick to the flavors you know work for your palette if you don’t want any unpleasant surprises after long hours of grilling your ground beef patties for your burgers. Taking out a kitchen weighing scale, every time you are in the mood to grill some burgers is not a practical option. 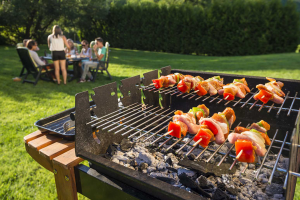 In most cases, grilling hamburgers is an outdoor fun activity and being bothered with the exact measurement of spices might be the last thing you want to worry about. That’s why pre-made seasoning mixes are highly suggested. They not only make seasoning your meat fairly hassle-free, but also you would get the same taste every time since the balance in these seasoning mixes has been professionally balanced. Here are some great seasoning mixes to consider for making great tasting burgers. Give your hamburger a real BAM with Emerils Ssnng Bamburger seasoning. A well-blended combination of Granulated Garlic, Onion, Sea Salt, peppers, Celery Flakes and soy protein, this will be your secret, go-to-getter seasoning for perfect hamburgers every time and no one would know that these hamburgers are home-made. Bolner’s Fiesta hamburger seasoning is one guaranteed way to get a restaurant like hamburgers at home, any time and every time. Just marinate your meat for half an hour before you plan to cook and that’s it. Bolner’s Fiesta doubles the flavor if you add some Worcestershire sauce, olive oil or egg to your meat. Bolner’s Fiesta is addictive so get ready to make hamburgers every weekend. This is a multi-purpose seasoning that spices up hamburgers, grilled meat, fries, and veggies. A delicious combination of brown sugar, onion, salt, red pepper, garlic, citric acid, and paprika, Rub Your Burger is an easy way to add perfect, delicious hamburger to your weekend party menu. If you wish to spice up your weekend and your dinner menu, you don’t need many ingredients but just one shaker bottle of The Spice Hunter by Grill Shaker. As the name says, it’s a spicy mixture of black pepper, whole brown mustard, basil, rosemary, paprika and chili pepper with no artificial flavors to label your meal unhealthy. Let your weekends be hamburgers, beer, and your favorite movie. If you prefer quick meals and an easy-to-make seasoning mix for grilling hamburgers outdoor, Durkee’s Roasted Garlic seasoning it is. This is a pre-made blend of roasted garlic, green and red peppers, chili flakes and dehydrated onion. It comes in an easy-to-store 21-ounce container; this is one of the must-haves in your pantry. A coarse blend of carefully measured bell peppers, peppercorns and chili flakes, Durkee’s six pepper blend will free you from the hassle of mixing spices all by yourself. This seasoning blend is best-suited to those who are looking to grill burgers in large quantities because this takes care of your measuring needs. Ever imagined the magic smoked paprika and tomatoes can bring to your meat? Give your hamburgers and meat a premium taste with Weber Gourmet’s burger seasoning mix. A spicy blend of smoked paprika, sea salt, pepper, sugar, chili flakes, brown sugar, and tomato powder, this is all that you need to ooze your hamburgers. A healthy and delicious choice for kids and adults. The best thing about McCormick All American Burger seasoning mix is the number of ingredients incorporated. This one compact seasoning mix encompassing all spices, sauces, and herbs you could ever need to season your patties together. The tanginess of tamarind and mild sweetness of Worcestershire sauce balances the spice kick of peppers and chili. Additionally, the dash of parsley is what you need for an exotic herb flavor. An easy way to have classic American hamburgers at home. For those who like their hamburgers salty and spicy and every time you make an effort, your spices go wrong; My Family’s Hamburger Seasoning mix is what you need. With a touch of kosher salt, paprika, garlic, and onion powder and cayenne pepper, you don’t need to add extra ingredients to your meat anymore. There is no MSG, gluten and harmful preservatives so you can have healthy hamburgers every weekend. Grilling hamburgers can be delicious and fun, but a bland overcooked burger without any flavor can be a bit boring. No amount of ketchup, mustard or mayo can take care of an under-seasoned patty. Therefore, using a pre-made seasoning blend that you know will cater specifically to your palette is the route to take.